An increasing obsession with staying fit is in vogue, and thus Aspirations flats for sale in Kolkata are equipped with modern fitness equipment with the motto of providing a healthier tomorrow. Aspirations fitness rooms are designed to cater both the young and the old, male and the female- for the aged, gentler disciplines like yoga are arranged while for women intensive weight-loss equipment are brought into concern. Why are fitness rooms important in residential projects? Aspirations as the best real estate developers in Kolkata is equipped with free weights, weight benches, treadmills, resistance machines and cardio-vascular machines. One can choose and train himself with the choicest equipment. Moreover, the most crucial aspect is that you will be bestowed with quality trainers too! 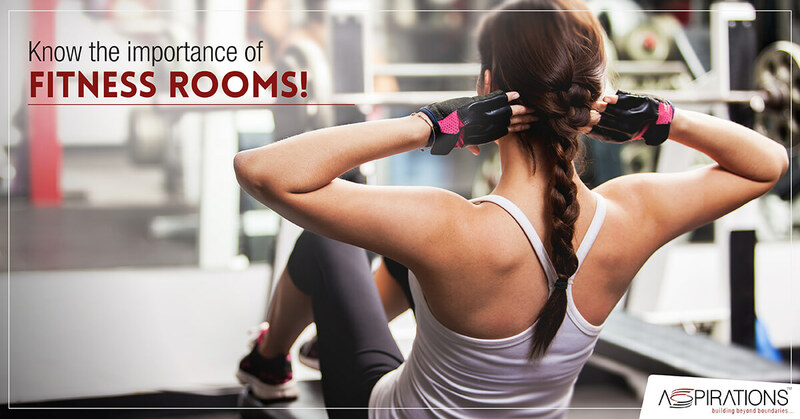 Once your desired fitness centre comes home, your worries about travelling outside to workout in rain or scorching heat become nullified. Your exercise bike or even the treadmill is now just a door away. Aspirations as the most trusted real estate developers in Kolkata provides you with the safest and most comfortable environment for a workout with hygienic and premium quality equipment that prevents accidental injury. Group workout sessions are often held where interaction with your co-partner becomes vital. Group yoga sessions are held where you get to choose the level according to your preference. Since chalking out a routine for exercises often stands tough to maintain when you are alone, it is always better to make friends out there. Getting healthier and remaining fit together is a fun-filled experience. The sense of togetherness motivates you into performing better. Jogging together will keep you away from problems with blood pressure, cycling together will eventually keep your body flexible and strengthen your muscles. As the old maxim goes, good things happen to those who sweat, a daily routine of workout will eventually boost up your memory cells increasing your sharpness eventually providing you with ample confidence. It will strengthen your heart and keep you away from metabolic diseases, cardiovascular diseases and even diabetes being one of the most recurrent problems in the current age. Aspirations flats for sale in Kolkata promises to provide you with the maximum out with top-notch standards. Staying fit at the end of every day is what anybody will desire. A healthy body leads to a healthy mind which regulates your familial and every vital relationship. Do not wait to think, engage with Aspirations to explore a fit and productive living. Open Plan Kitchen: Why is it Preferable?